Wanted - Your Testimonials! $5 Reward! WANTED - Your Testimonials About Our Products Or Silver! We LOVE your testimonials and so do our visitors! For us, it reinforces that we are accomplishing our sincere mission to provide affordable products that make a difference. For our visitors, it helps them get to know our products before they commit to trying them. So we want to offer $5 off your next order of $30 or more for every story about you share where Colloidal Silver (our product or your past experiences with silver in general), our gels, BreatheEasy Lung Exerciser, Silver Conductive Socks or even our Customer Service has made a difference in your life! "I first came to learn about silver as a health benefit shortly after I joined a forum about all things silver. 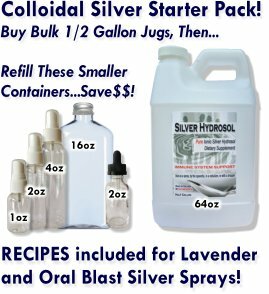 I had been learning the benefits of silver as a hedge against inflation and saw many members tell their stories of colloidal silver. As an avid health researcher, I ordered my first product off and tried it. But at $30 for 8 ounces I knew I wasn't going to keep buying it. So I started researching if I could make it. I spent a month devouring the internet, trying to find the essential truth about colloidal silver and finally was ready to buy equipment and make it myself. Even though many people make it using a few batteries and silver wire, I came to the conclusion that ionic silver was the product I was looking for and to get that, I needed a computer controlled device. So I ordered the most expensive one and started taking large amounts while also sharing gallons of it with friends and family. The results were intense and quick! Time and time again, it triggered an undeniable Herxheimer Reaction and with that I was sold! And remembering that $30 8-ounce bottle I had bought, I decided to research making my own brand, which I did 4 years ago. And the rest is history....this company was formed out of my successful use of colloidal silver hydrosol and all the products on this site are ones that made a difference in my life!" How to Get Share Your Story? It's Easy! Simply fill out this form along with your order (this form will also appear after you successfully checkout). No sickness for me with ionic Colloidal Silver Hydrosol! After using it all winter I never got a cold or flu all winter.... I’m hooked!